The largest nachos in town! This delicious mountain of chips is topped w/ refried beans, mixed cheese, lettuce, olives, jalapenos, tomatoes, & sour cream. 8 delicious shrimp strategically placed around a chilled martini glass filled w/ our spicy cocktail sauce. The glass is garnished w/ a lemon to add a bit more zest! It's out of this world & just doggone purdy!! A half pound of delicious battered chicken strips served on a hot 1/2 pound bed of french fries. Yes, that’s right - if you eat this & you weigh 189 pounds, well congratulations you’ve just been bumped up to the heavyweight division at 190 pounds. So, enjoy! Our own special recipe combining cheese with, uh, some more cheese, a bit of pico de gallo & some other special, top secret, "mind your own business & just enjoy it" ingredients. One of our more popular recipes based on our market research, which basically means that all the staff really loves the heck out of it! It's served w/ as many hot chips as you care to woof down. 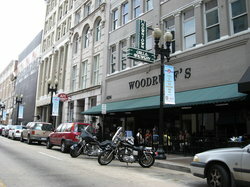 Warning: woofing down food in any form is not recommended or endorsed by the downtown grill & brewery. Do so at your own risk. Savor & enjoy the food! Some say these are similar to buffalo wings, but since we live in knoxville, we had to apply our own special recipe-notice the low population of pigeons in the area. Just kidding. We offer one or two of these jumbo wings & fry them to perfection. We offer them in bbq, hot, or "fire & brimstone". We didn't want them to be lonely, so we serve them w/ a Side of celery & bleu cheese. Brewer's note: if you need to cool the temperature down, extinguish it w/ our white mule ale. Some say po-ta-to, some say po-tah-to. We just get to the point & call 'em taters! Any way you say them, they're good eatin'! We cut these fellows in half & layer them w/ mashed potatoes, mixed cheese & bacon & offer you a Side of sour cream to top them off. However, if you really want to know why we call them taters, you have to top them off w/ our taco beef, mesquite grilled chicken or steak. Your mouth will be so busy, you'll only have time to say tater! We take the mallets from the whack-a-mole games at arcades & beat the uh, conSider it anger management. Actually, we make our guacamole dip fresh each day for your taste bud enjoyment! We serve up a large of portion of this w/ our hot & fresh chips! Our homemade salsa made fresh daily & served w/ an endless supply of chips. Okay, that's not totally true. We will eventually run out of chips. I mean come on, do you know how much time & energy goes into making those things? Seriously, you really wouldn't want it to be endless. After we sauté up our mexican veggies & mushrooms, "on goes" our mixed cheese, which we melt to perfection. We serve this w/ some warm tortillas for you to fill to your liking. If you desire, after the mexican veggies "on goes" your choice of mesquite grilled steak or chicken, portabella mushroom, or grilled shrimp to make this appetizer a truly amazing dish for your palette. This is our original recipe which all other places have stolen & added to their menus. It's a disgrace i tell you. Actually, maybe we weren't the first but we happen to think they're a good idea. So, we added them to our menu w/ our own special marinara sauce for dipping! We​ lay down a bed of iceberg lettuce mix & cover it w/ eggs, ham, turkey, olives, tomatoes, mixed cheese, onions, mushrooms, & your choice of dressing. If you like, we'll throw on a piece of grilled chicken for an extra few dollars. Hey, it's hard work catchin' 'em chickens. 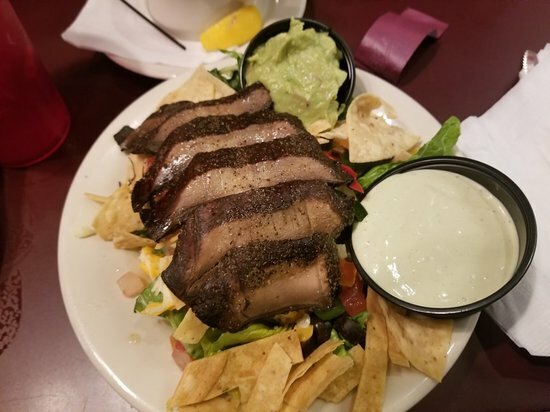 For​ those of you that didn't want the full fajita dish or are afraid of the sizzle they make, we offer them in a salad version. 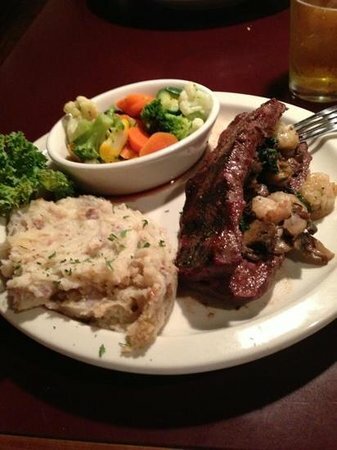 You get your choice of steak, chicken, or portabella. We lay these on top of a bed of romaine or iceberg lettuce mix, pico de gallo, mixed cheese, sour cream, red onions, mexican veggies & black olives. Heck, we'll even throw in the dressing just for you - not that guy across the room, just you. You have choice of either an iceberg lettuce mix or a caesar salad bed. We top the iceberg lettuce w/ mixed cheese, diced tomatoes, olives, & eggs - w/ your choice of dressing, of course. The caesar salad is tossed w/ diced onions, black olives, diced tomatoes & sprinkled w/ parmesan cheese. Brewer's note: enjoy this w/ a light bodied ale, like the downtown blonde! Once again, you have your choice of either an iceberg lettuce mix or a caesar salad (see above). We top it w/ our grilled & sliced mesquite fajita steak, red onions, bleu cheese crumbles & mushrooms & accentuate it w/ some of our chunky bleu cheese dressing. This dish is a wonderful way to get to know your server. It's made table Side w/ grace & skill using the following: salad mix, greek dressing, celery, kalamata olives, diced red onions, capers, pepperoncini, feta cheese, & a splash of lemon juice. A lovely way to receive your daily allotment of greens. We offer it in either a house or caesar style. Let your taste buds be your guide. Hot & sizzling (keyword: hot) marinated steak, chicken, shrimp or portabella served on top of mixed peppers & onions. We serve these delicacies on a hot skillet w/ a Side of sour cream, mixed cheese, lettuce, & pico de gallo. These things scream how good they are on their own because they're on a hot skillet! All fajitas are served w/ a Side of rice & beans & flour tortillas. Not to be alarmed friends, we mean a burrito here, not the pack animal. We stuff our flour tortillas w/ taco beef, refried beans & mixed cheese & bake it to a golden color & top it w/ our homemade salsa. We couldn't call ourselves a pub unless we carried this traditional meal of beer-battered fish served w/ our homemade cajun tartar sauce & golden brown chips (fries, if you will). Brewer's note: enjoy this w/ a traditional pale ale, like the white mule! In the tradition of the great threesomes throughout history: the three stooges, the 3 musketeers, charlie's angels, the brady boys, & the brady girls (although, that's really six, we suppose), we offer the taco trio. Three spicy beef tacos filled w/ lettuce, tomatoes, & mixed cheese. We recommend it w/ rice & beans. However, the Sides are a duo you can choose. Caught off the coast of montana - near a snipe farm, these lil' buggers put up a heck of fight. Nonetheless, we begin grilling the chicken breast then cover it in our sweet stout bbq sauce. After grilling it to a moist state we cover it w/ mixed cheese, tomatoes, & bacon & even place it on a plate (see, we care). Our 10 oz. Chicken breast mesquite grilled to a juicy perfection. We can season this w/ lemon pepper, cajun spices, caribbean style, or blacken it. For a nominal fee we can top it w/ pepperjack cheese. A combination of our alfredo sauce, mushrooms, & grilled chicken. We then toss it around a bit w/ our penne noodles (not in a mean way - a delicious way). We put this in a pasta bowl & top it w/ mozzarella cheese & bake it to perfection. A combination of our homemade marinara sauce, diced fried chicken strips, & mushrooms. We toss this w/ the skill of a master sword juggler, actually more of the skill of a master pasta flipper but no time to be picky. 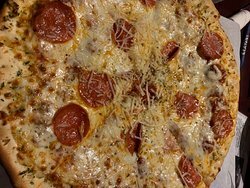 We cover this w/ mozzarella cheese italian seasoning & coincidentally enough cook it to perfection. 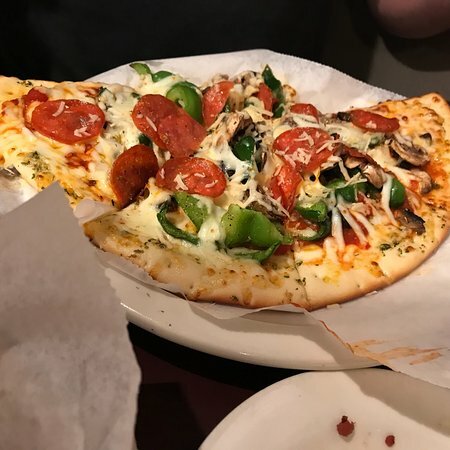 Imagine​ if you will a pizza - try not to cramp up. Now, imagine marinara sauce tossed around penne noodles, italian sausage, mushrooms, peppers & black olives then we top it w/ sliced pepperoni. We sprinkle this w/ italian seasoning & yet again, w/ deft skill, we cook it to perfection. Our own special alfredo sauce tossed w/ fettuccini noodles. It's a light & creamy dish unto itself. However, you can make it more filling w/ chicken, portabella or shrimp for just a few dollars more each. There's nothing worse than chickens that have gone awry (get it, caper?). Well, maybe, but we really don't want to think about those types of things. We top our mesquite grilled chicken w/ sautéed mushrooms & onions, chopped parsley, & of course our capers. We offer this either on a bed of fettuccine noodles or w/ two Sides. See, we're not as bad as the chickens. Variety is the spice of life or in this case, cajun spice is the spice of life. We take our mesquite grilled chicken & cover it in cajun spices & then dice it up. We toss this in our cajun alfredo sauce along w/ diced peppers & fettuccine noodles. We lure 14 of our jumbo shrimp into our sauté pan - their bodies are big, not their heads; therefore, they're not too smart. We sauté them & serve them in our homemade scampi butter. 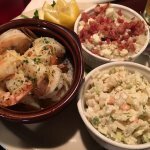 We serve these delightful, mouthwatering morsels w/ two of our Sides. Can you feel yourself beginning to drool? Brewers note: get your taste buds ready for this tasty meal w/ a woodruff IPA! Imagine if you will, delicious shrimp coated in lemon pepper & garlic butter. Their delicate little forms skewered & cooked over an open flame mesquite grill to a perfectly plump state & served w/ a Side of our rice & vegetables. Okay, now stop imagining & start ordering because these things are waiting for you! Brewer's note: enjoy this light, delicious meal w/ a light beer, like the downtown blonde. Our hand cut fresh atlantic salmon, cooked over our open flame mesquite grill. You can have it w/ some extra zing by cooking it blackened style, cajun, caribbean, or lemon-pepper style. We serve it up w/ two of our Sides. It's sushi grade tuna, although we ran out of chopsticks so it's not rolled sushi style. Not to mention, it's a 10 oz. Cut & very few people could cram it in their mouth in one bite. Anyway, we offer it in several different styles: blackened, cajun, caribbean, or lemon-pepper. You can have two Sides placed on the plate for your timely consumption. After several hours of a grueling fencing match, we finally caught these guys & have them prepared for your delight. We marinate the swordfish filets in a mango-vinaigrette & then grill them on our mesquite grill for added flavor. 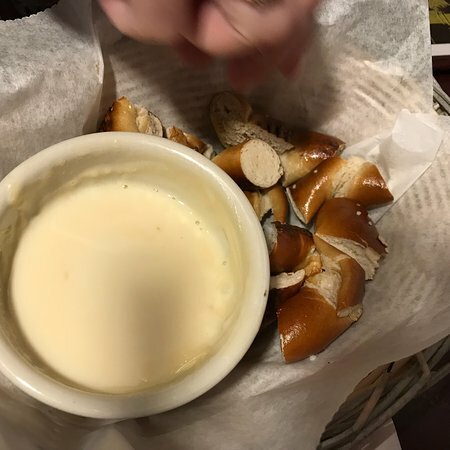 This entree includes two Sides. Good​ enough to make the spirit of captain woodruff reach up & smack the cook for not having it when he was around! We take our 10 oz. Sirloin & stuff it w/ sautéed shrimp, spinach, mushrooms, bacon, parmesan cheese, & garlic butter. We let this marinate for several hours & then cook it to your liking. We place two Sides on the plate for you to save until last because once you start this you won't want to stop. For those w/ a creative flair (and legal body), this meal is best enjoyed w/ our signature beer the woodruff ipa! A tasty 12 oz. Ribeye, seasoned & grilled to a perfect state. Trust us, the grill marks are so defined you can play tic-tac-toe on them. However, remember what your parents said about playing w/ your food - you'll go blind or something. 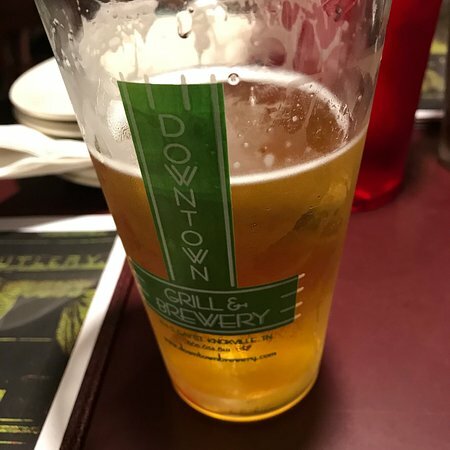 Downtown grill & brewery. Drink good beer. Don't grab badgers. Don't get busted. All good advice that can be reflected on while consuming this tasty pizza. We top our 12" crust w/ our homemade cheese sauce, mexican veggies, sliced mushrooms & mozzarella cheese. You then can have your choice of marinated steak or chicken sliced & placed on top. This is your standard pizza that every plain jane (no offense intended, you wild janes) will love. Our tasty pizza crust is covered in our chunky marinara sauce & topped w/ 4 different cheeses. We cover our pizza crust w/ an alfredo sauce (not just any alfredo, but ours). We then sprinkle it (it being the pizza) w/ cheese & italian seasoning. We decorate it w/ sliced tomatoes & a lovely spinach blend. At this point it's close to a vegetarian item; however, for you omnivores (big word, huh?) Out there we can add our mesquite grilled chicken for a truly exotic taste. Our skilled grill master delicately grills this on our mesquite grill the chicken that is. We use our sweet stout barbecue sauce as our base & top it w/ our grilled barbecue chicken, red onions & mozzarella cheese. It's a delicious item that's doing its part to bring the bib back into style. Brewer's note: appreciate all the flavors by getting your taste buds started w/ our state street stout. So,​ you're 4,496 miles away from honolulu & you're craving a hawaiian pizza. Well, you could spend your kids college education to drive there (don't mind the big body of water called the pacific) or you could just ask your server for our tasty version served w/ pineapple rings, ham bacon, & mozzarella cheese. We​ offer you over a pound of food on this all american classic. 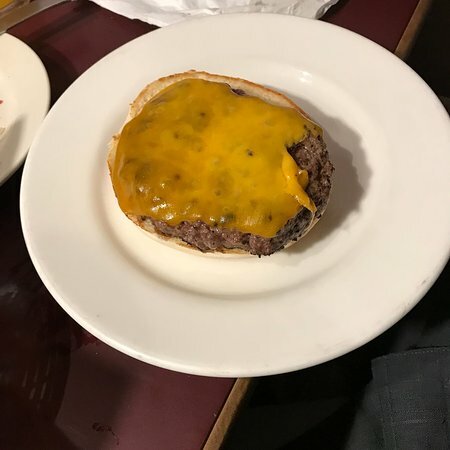 It's a half-pound of ground beef cooked to your liking & served on a corn meal bun topped w/ lettuce, tomatoes, & red onions (mustard & mayo upon request). We then dress it w/ another half-pound of golden brown potato sticks (french fries friend, french fries). For a nominal fee you can top this classic patty w/ either: 1 of our 8 different cheese choices, bacon, mushrooms, or any combination thereof. This​ is the mother of all mother misery makers w/ its messiness. So, if you're ordering this it's time to monitor your messiness by asking for more napkins. But believe us, it's worth eating w/ a knife & fork if you're that kind of wuss. We start w/ our half-pound of ground angus beef & cover it w/ our button mushrooms & onions, swiss cheese & enough bacon for this to be classified as a "pig in a blanket" type sandwich. Once again, this is served up w/ half-pound of french fries. 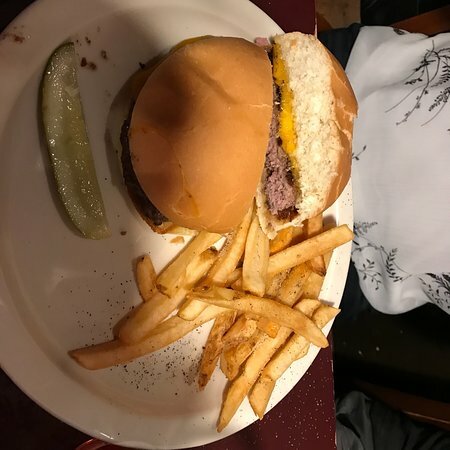 This monster of a burger will fire up your taste buds to get them ready for a wave of flavors that will keep you searching for the next bite - watch your fingers around the edges. We cover our half-pound angus burger w/ barbecue sauce, red onions, both cheddar & monterey jack cheeses & jalapenos. We provide a Side of guacamole for spreading on your bun (not that one wise guy). Oh yeah, not that you'll need them, but we'll throw in the half-pound of fries. We stuff our large hoagie roll w/ your choice of mesquite grilled chicken or mesquite grilled fajita steak, mexican veggies, & jack cheese. 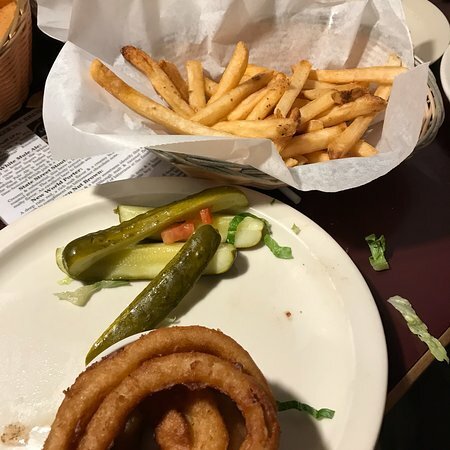 We serve it up w/ some of our hot & tasty french fries. It's a classic - for an added delight, add some mushrooms for possibly less than you paid for parking! Have you ever tried to get a chicken to strip in marinara sauce? Neither have we. So instead, what do you say you try some of our crispy chicken strips covered in marinara sauce & jack cheese & sprinkled w/ parmesan cheese & oregano. We place this lovely morsel onto a corn meal bun & serve it up next to a heaping mound of our golden french fries. Here's the deal. We're lazy. Read the santa fe burger & substitute chicken for burger. Thanks. We thought that this would make us sound a bit more sophisticated. We know, we know, it'll probably take more than three little words - but we tried. Nonetheless, we grill our chicken breast to perfection (have you noticed a theme w/ this perfect thing? Us too! ), then we top it w/ some sliced ham, swiss cheese, & slices of bacon. We place it on a comfortable, corn meal bun & serve it w/ our large portion of fries & a Side of ranch dressing. We grill a large marinated portabella mushroom to perfection (with grill marks to prove it). We place it on our corn meal bun & add tomatoes, lettuce, onions, & jack cheese. We recommend eating it w/ the steamed vegetables or rice; but hey, we're not your mothers! Eat what you want - unless your mom is w/ you, & in that case, check w/ her! A delicate & light dessert flavored w/ the rich taste of chocolate (come on, you can hear it calling your name) & accented w/ a hint of kahlua & godiva chocolate liqueur. We top it off w/ a bit of whipped cream (always a fun thing) & an artistic splash of chocolate. Not too filling, yet really rounds the meal out. In other words, splurge! How often do you dine out?! We​ use our mixed cheese & cook it just kidding. We serve this rich tasting dessert w/ your choice of topping: strawberry, raspberry, chocolate, or caramel. The only thing that can possibly make this better is a cup o' joe & of course, you eating it! We wrap our homemade dough around your choice of filling (banana & pecans or cinnamon apples) & fry to a rich, golden brown. We sprinkle it w/ cinnamon, powdered sugar, drizzle it w/ honey & serve it next to a scoop of vanilla bean ice cream. It's an experience all must try. Seriously, it's been written. Well, we wrote it, but it's still been written. A delicate flour dessert which, once fried to a golden state of perfection, is forced to expand to hold in its rich flavor. Once inflated we pull it from the fryer & drizzle it w/ honey, cinnamon & powdered sugar & place it on a plate for your approval! The classic dessert returns! Banana, ice cream, chocolate & strawberry toppings, whipped cream & nuts topped w/ a cherry. We sell it every day. Hot brownie, cold ice cream, chocolate syrup w/ whipped cream dollop on top. هذا هو نقطة ذهابي المصنوعات اليدوية بارد البيرة، الطعام جيد. دائما جو رائع. لا تذهب هناك غالبا ما عندما يتمتع المساء وسط المدينة. أكره أن تكون بسيطة إلا أنني تناولت الطعام هنا مرتين في الاسابيع القليلة الماضية، إلا أنّها المشوي مع البطاطس. أعرف أنه لديهم الكثير من طعام ممتاز ولكن اسمحوا لي أن أؤكد على مدى ضخم رائع البطاطس الجلود. أتمنى لو كنت قد صورة فوتوغرافية. لقد جئنا من خارج المدينة. رائع. البيرة رائعة والطعام خطوة أعلاه. كل شيء يمزج بين على إقامة ممتعة للغاية المساء. ملاحظة: لقد ذهبنا في اليوم الاربعاء. أنواع البيرة فقط 2 . 50 حتى 8:00 مساءً. نحب الذهاب إلى وسط المدينة Grill and Brewery! بها جو من المرح، طعام رائع. مصنع هو نقطة جذب رائعة. أحب البطاطس المشوي مع! ! بنصيب وافر، بما فيه الكفاية على وجبة! ! جيد بسيط بار الأطعمة في جو مريح. اصطحب الأطفال. سوف تجد الكثير من الطعام. يمكنك أيضا. الطعام جيد جدا و البيرة رائعة. مجموعة مختارة من البيرة المصنوعة جيد. سوف يكون مزدحم للغاية في عطلات نهاية الأسبوع أو عندما عرض اللعب في تينيسي. ذهبت إلى هنا اليوم الجمعة ليلة بعد العمل مع صديقة، كان رائعا! كان الطعام شهيا وكان الجو كان رائعا! بالتأكيد سوف أعود مرة أخرى وأنصح به. وكانت هذه المرة الأولى لي في هذا المطعم، لا يمكنني الانتظار حتى نعود مرة أخرى! دائما بالكامل مع نطاق كبير من خيارات تناول الطعام، هذا المكان لديه شئ تقريبا كل الأذواق. احصل على إجابات سريعة من موظفي ‪Downtown Grill & Brewery‬ وزوار سابقين.